In a 2016 trial, Cadieux v. Saywell, the jury awarded a severely injured plaintiff $2,309,413 in damages. The plaintiff commenced the civil action after he was pushed onto the road by another man and then struck by a truck. The driver of the truck and Mr. Saywell, the man who pushed the plaintiff, were named as defendants in the lawsuit. The incident occurred when the plaintiff and Mr. Saywell became involved in a verbal confrontation near the side of the road. The defendant pushed the plaintiff in the direction of the road, causing him to stumble onto the road, where he was struck and run over by an oncoming truck. As a result of the accident, the plaintiff sustained a fractured skull, brain damage and various orthopaedic injuries. The jury determined that liability for the plaintiff’s injuries was shared equally between the driver of the truck (with whom the plaintiff had previously settled three years before the trial), the defendant Mr. Saywell, and the plaintiff. This means that the plaintiff’s award was reduced by one third, due to his contributory negligence. In Cadieux v. Saywell, a motion was brought to determine the required adjustments to the jury award, in accordance with Rule 57 and 49 of the Rules of Civil Procedure. The items to be decided (some of which will be expanded on below) include: statutory reductions; application of pre-judgment interest; any reductions for collateral benefits already received by the plaintiff; management fees; and costs of the action. The only award to be effected by statutory deductions was the plaintiff’s brother’s award of damages under the Family Law Act. The plaintiff’s brother had been awarded $30,000 by the jury. However, in accordance with changes to the Insurance Act which became effective Aug 1, 2015 and which the judge held to be retrospective, this amount was reduced by $18,270 (to $11,730). The plaintiff’s award for general damages (for pain and suffering) was $225,000 and is therefore above the threshold and not affected by the statutory deductibles. Similarly, the plaintiff’s father was awarded $80,000 in damages under the Family Law Act, and this amount was also not affected. More than 3 years before the trial, the plaintiff was awarded statutory accident benefits (SABs) from his vehicle insurance provider, in the amount of $900,000. This amount included $300,000 in past and future income replacement benefits, $250,000 in medical benefits, and $350,000 in attendant care benefits. The plaintiff used these funds to buy a settlement annuity (for the sum of $500,000), a suitable house, and to pay legal fees and other expenses. The judge in Cadieux was required to decide how much of the already paid-out SABs settlement should be deducted from the jury award for loss of income and future pecuniary damages. The jury award for cost of future care was based on a consideration of expenses for: physiotherapy ($23,073), occupational therapy ($9,491), social work ($4,745), home gym equipment ($3,569), taxi fund ($49,992), bookkeeper ($31,380), and an acquired brain injury (ABI) support worker ($701,809). The plaintiff was also awarded $12,500 for past expenses and $33,113 for future housekeeping costs, in addition to applicable pre-judgement interest. The judge noted that the most important deductibility issue is whether or not the jury award of $701,809 for an ABI care worker should be reduced by the $250,000 SABs settlement for past/future medical benefits or should also include deductions for the $350,000 SABs settlement for past/future attendant care benefits. The judge referenced the decisions Mikolic v. Tanguay et al (2016) and Basandra v. Sforza (2016), and concluded that $600,000, the SAB’s settlement for medical and attendant care benefits, is the appropriate amount to deduct from the jury award. The judge decided 5% is an appropriate management fee to pay for the management of the plaintiff’s assets (to be carried out by the plaintiff’s father). The amount of outstanding damages owed to the plaintiff by the defendant, Mr. Saywell, were determined to be $435,577. It is quite common, in the case of motor vehicle accident injury claims, for an accident victim to claim statutory accident benefits under their vehicle insurance policy and also pursue a civil action against the negligent party. This approach allows injured persons to receive needed compensation fairly quickly, until their civil suit is resolved. 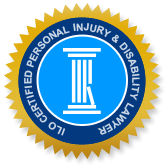 If you were injured and are claiming compensation for your losses, call a knowledgeable ILO lawyer to find out about your legal rights and options, given the unique circumstances of your case. The Kitchener-Waterloo motor vehicle accident lawyers are highly experienced in representing victims of car accidents, pedestrian and cycling accidents, and motorcycle accidents, and offer a free initial consultation that provides a great opportunity to have your questions answered and find out how we can help.